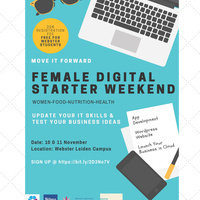 In collaboration with Women's Business Initiative International, Webster University Leiden Campus and Women Enterpreneurhip Platform, the Digital Leadership Institute is proud to announce a FREE Move It Forward - female digital starters event on 10-11 November 2018 in Leiden. This initiative is supported by top technology companies, non-profit organisations, and youth and women's networks and communities. Its objective is to give teen and adult women* the skills to become digital entrepreneurs and leaders, and to support them in driving positive change in their communities. Jury Members & Coaches: Move It Forward female digital starter events are supported by a members of the startup community, mentors and coaches who generously give their time and expertise to help participants deliver awesome projects and enterprises. Laptops: Participants will need a laptop to fully benefit from this event. If you do not have access to a laptop please let us know in advance and we will reserve one for you. Supporters: Move It Forward would not be possible without the support of our awesome partners and sponsors. Kindly contact us if you would to support this event. Opportunities exist for Move It Forward volunteers, interpreters, coaches, jury members, content and media partners, prize contributors and sponsors. The importance of such an event is very necessary https://thetripleplay.net . This type of event is a good opportunity for female. The job is an essential part to improve their self. This is completely concentrated on the female. This is a good opportunity for them. Super useful event on such a relevant, cutting edge topic. I really hope that a follow-up event is held this year.